This item is temporarily out of stock. Fortunately we have stocked up on top selling Grilled Cheese & Tomato Soup which is available now! 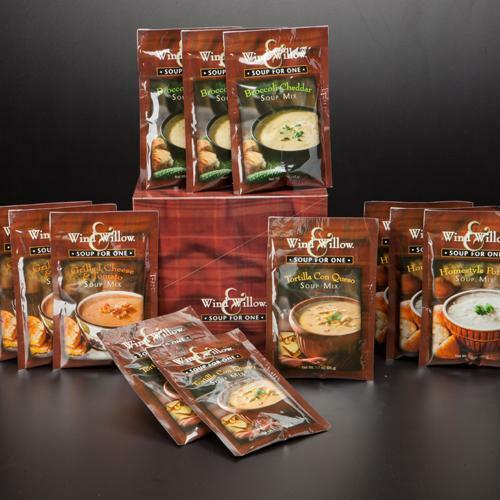 12 1-Cup Soup Mixes in Ready-to-Gift box. Add a cup of boiling water, stir and cover for 2 minutes. For indoor use just add water and microwave. Includes 3 each; Broccoli Cheddar, Homestyle Potato, Grilled Cheese & Tomato and Tortilla con Queso Mixes. Perfect for hikers, college students, office workers, singles or anyone who would enjoy a delicious cup of creamy soup in minutes!